Adam's Eclipse analytical balances are highly advanced laboratory weighing machines that feature readabilities up to 0.001g. 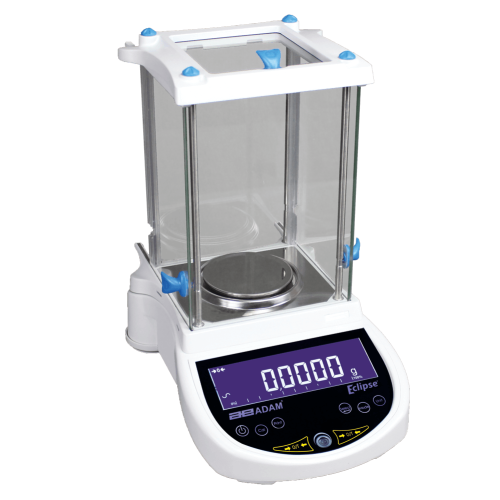 Eclipse analytical balances include a glass-enclosed draft shield to protect the weighing chamber during sensitive weighing experiments. The balance offers an array of weighing modes including percentage weighing, checkweighing, dynamic weighing and density determination for completing scientific-based weighing experiements with ease. An innovative design results in a compact footprint that occupies minimal space on the lab bench. Single-piece construction allows greater stability, enabling highly repeatable results. Containing fewer parts than a traditional force motor balance, the weighing sensor features an optimised internal mechanism, helping the Eclipse tolerate rigorous laboratory use. The Eclipse analytical balance is a highly professional balance often used in medical testing for measuring pharmaceuticals. Eclipse balances feature exceptionally high readabilities, that allow powders and chemicals to be weighed in tiny microgram increments for manufacturing pills, medicines and other drugs. Eclipse analytical balances are highly sought after by food testing laboratories. The balance comes complete with checkweighing and percentage weighing functions that allow food samples to be tested and individual ingredients of a product to be weighed to ensure they meet the product specification and food health and safety guidelines. Chemists often require high-precision laboratory balances for weighing medicines, vaccines and chemicals used in cosmetic products. Eclipse analytical balances combine high precision with advanced weighing functions to ensure that chemicals and compounds can be tested with little difficulty. Most people use scales and balances interchangeably to weigh objects, ingredients, animals, and people; and yet these instruments work in many different ways. In this post, we'll cover basic explanations of the various mechanisms that allow scales and balances to function. Many Laboratory balances and scales feature GLP compliant printouts as a selling point. But what makes a printout GLP compliant? What does GLP mean? Why is it important? Does your balance need to offer printouts in order for your lab to comply with GLP?